I looked online, and I was actually able to find Lemmings Return! The resolution for the game is over twice as large as the resolution of my phone's screen, and I can't seem to change it anywhere. That is a bit unfortunate, as it makes it rather tedious to navigate the menus - you need to try out every option, as you can't read what you've got selected. However, the game itself works fine! Of course the playing field is extremely narrow on such a low resolution screen, but it works. This is cool! I'll probably play it when I don't have anything else to do, as I am wondering about the levels. The book says there are 30 levels, divided into three ratings. I can only play levels from the first rating, though, so I guess you need to unlock the rest. I expect all levels to be rather easy, but who knows, there might actually be some puzzles in here. In any case, all levels seem to be original, and designed with the original pieces. They are put together poorly, though, none of the levels look good. 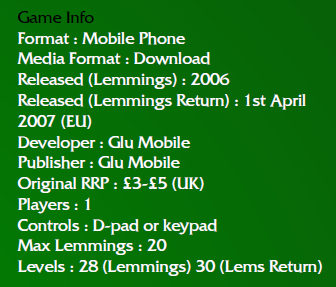 But another thing: I've only been able to find this game, and I can't find any mention of there being another Lemmings game for phones, except in the book. The book's probably right, but if the writer reads this: where did you find this information? I'd like to play this game, if it still exists. My assumption about all levels being original was incorrect: so far, I've come across This should be a doddle! and We all fall down. So there are levels from the original game in here too. Since then, all levels have been levels from the original game, which makes me a bit confused. I wonder now, if somehow the earlier levels were, too. But I didn't recognise them. Something I noticed about the mechanics, which makes some things harder: Lemmings without a skill gain priority if you're hovering over multiple Lemmings. This means that if you want to make a miner into a basher, for example, you'll need to isolate it, or it'll keep mining and you'll use up all your bashers on the other Lemmings. The one in the screenshot looks like it might be a remake of Tame 1? I've lost my phone yesterday, but I'll get it back (I left it in my cousin's car). When I get it back I'll list the names of the levels I've unlocked so far, in a spoiler tag. Has anyone had the other Lemmings game? Or The Tribes for cellphones? I read today that that existed as well. 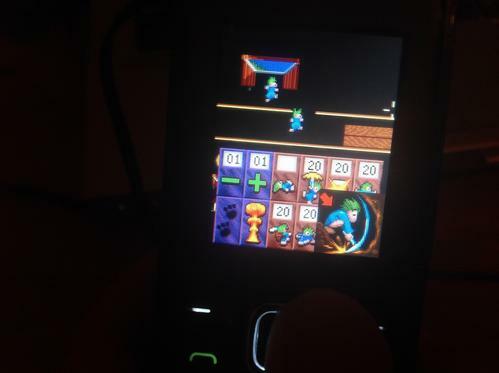 I found something on Lemmings 2 for smartphones, but not for Java-based feature phones. Fun 5 Thunder-Lemmings are go! Fun 6 This should be a doddle! Taxing 2 Turn around your Lemmings! Edit, so I don't create more unnecessary posts: Haha, I was struggling with Perseverance, but then I noticed you've got 20 Floaters for some reason, while the amount of Lemmings in this port is also 20. In The Boiler Room the fire object is missing, which makes the level pretty much trivial, even though it's placed in the last rank. Crossroads is called Said the spider to the lemming, and I'm currently at Double Trouble, which when looking online isn't a level in the original Lemmings games. Which is strange, because it sounds and looks like a level that's got two hatches, but it's only got one on the left side. As Proxima was saying it could possibly be the tame level from the oh no more lemmings. I think I remember seeing the mobile one being advertised in a magazine but that feels like a long time ago. Leo sent me the other two games, but unfortunately, I can't use either of them on my phone. They play, but the screen doesn't scroll well enough, and the skills don't display either. Oh, I forgot to say: I completed the game recently! I thought I had 3 levels to go, but I forgot there are only 8 levels in the last rank, instead of 10. Strange about the last level - but this is something more levels have - is that the save requirement was 10%. I think I got 85%, but 100% doesn't seem too difficult, if you time things better. There were also quite some extra skills, so even though I messed up a few things, I was able to beat the level rather easily. Oh well, it was a fun experience! It's really rather unfortunate that the other games don't work on my phone.